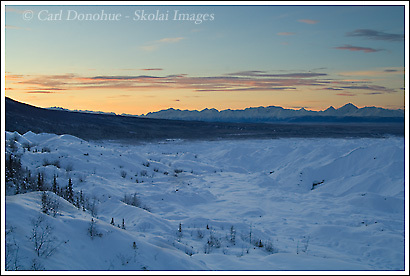 Here’s an image loooking south towards the eastern edge of the Chugach Mountains, in Wrangell – St. Elias National Park. The glacial moraine in the foreground is the edge of the Kennecott Glacier. I’d hoped to get up to Kennecott early this particular morning and catch some alpenglow on Mount Blackburn, which I did, but a pesky cloud obscured the very peak of the mountain, and I need get back there and reshoot the images. It was kinda frustrating, to be sure, catching a magnificent peak like Blackburn (16 390′ high) in awesome light, before dawn, glowing magenta and red, and not quite be able to see the peak. I’ve made 3 attempts so far, once it was completely clouded in, this time, and the last time it as minus 45deg F – the snowmachine I borrowed wouldn’t start – well, after it DID start, via a preheater (hairdryer plugged into a generator-powered AC socket) and an extra battery, warmed in my cabin the night before, it took 30 minutes just to get it warmed up enough to turn the tracks, by which time I’d missed the light I was looking for. Maybe sometime soon I’ll get another crack at it – the last week or 2 every morning was overcast enough that I knew Blackburn wouldn’t be visible. Hopefully I’ll be back in the park soon, and get to do some more shooting. This entry was posted in Adventures, Alaska, Landscapes, Winter, Wrangell - St. Elias National Park on February 24, 2008 by Carl D.
What a beautiful sunrise too. Isn’t there a small house on Kennicott glacier built by a pilot named James Shelton? I read a book on his flying around Denali a lot. It was very interesting. His flying ability around those mountains was awesome! It’s amazing he did it as long as he did. But I haven’t seen anybody that can make nature come alive like you can! Stay safe. I think you’re talking about Don Sheldon, a pilot who flew around the Denali area. He was the first pilot to land at the basecamp on Denali’s Kahiltna Glacier,at a place they call the Don Sheldon Amphitheater. There’s a book about him, called “Wager With the Wind”, which I’ve not read, but have a lot of great reviews about. He flew a lot of climbers from Talkeetna to Denali and back. But the Kahiltna Glacier is on the South Side of Denali (aka, Mt. McKinley), not in Wrangell – St. Elias National Park. Glad you got out ok! I hope you can get to the bottom of your vehicle issue. It can’t be any fun to head back out there knowing you still have a intermittent problem. I read Wager With the Wind many years ago – great book. Hey Carl, I’m sure they must have run a scan on it. I’m certainly no mechanic, but I work on my S-10 sometimes, & it sounds like a sensor.So that’s my 2 cents worth! Ha!Ha! Good Luck & let us know. Thanks. Feel free to come give it a lookover – it certainly can’t cost any more than the Dealer charges. 🙂 What’s really weird is that when it shuts off, and won’t restart, the “check engine” light doesn’t come on .. indicating the computer isn’t getting a read on anything being out of kilter. I’ve heard it could be the crank sensor, the catalytic converter, the fuel cap, 2 wires not connected properly, amongst myriad other things. I had an old Chevy pickup with a similar problem. My mechanic finally said to call him the next time it wouldn’t start and he would come over – that is the only way he could finally solve the problem. Turns out an ignition wire was crimped in the distributor cap. Of course that doesn’t help when you are out in McCarthy when you have a problem. Maybe your fuel line is freezing up, maybe not all the way, since I noticed in your earlier posts you were having to use a hairdryer to heat it to start. Maybe you’re getting a little chunk of frozen gas in there, causing it to stall out. Oh!! All these shade tree mechanics! !